I have been looking for a new handbag for awhile ~ and looking for one that last for awhile because once I start using one I don’t change it very often. I found Maggie Bags™! They have some really cute hangbags and tote bags. What is so unusual about Maggie Bags™? The handbags are made out of automotive seat belt webbing. The idea behind the handbags was to keep the millions of yards of narrow fabrics out of the landfills. Maggie Bags™ launched their first line of seat belt handbags in the spring of 2009 with a handful of retailers and a little online store. Today our fashionable and functional seat belt purses can be found in hundreds of retail locations across the United States, many online retail stores and in our own online store. Here is my new handbag. Isn’t it great for the summer? This bag is called the Cicily Tote and it comes in a variety of colors including Black, Cranberry and Dark Chocolate. What I really like about this bag is the great lining and pockets. It has a zippered pocket, cell phone pocket and a key pocket. It also has four-nickle plated fee on the bottom. I know the Cicily Tote will last me through many summers. I think it is the perfect size too – not too big not too small. You can find just the handbag you are looking for at Maggie Bags™ they have large handbags for multipurpose and sleek stylish seat belt purses. There are also so many color choice in each style, it is hard to just pick one. Their bags are fashionable and functional seatbelt handbags. 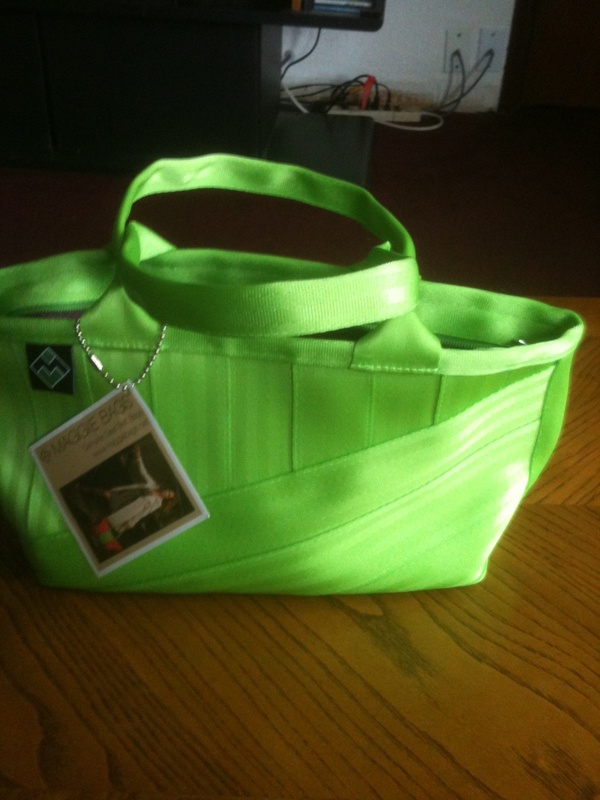 I really like than when ever possible Maggie Bags™ uses recycled seat belt webbing to make their beautiful bags. It is nice when a company is doing their part for the environment. If you would like to purchase your own Maggie Bags™ functional seatbelt handbags you can shop HERE. You can also find them at some local stores. Maggie Bags™ has also offered one of my readers a chance to win this great Tote of Many Colors in Chameleon Combo. Don’t you love the colors? This is an extra large, roomy tote that can hold lots! It is Maggie Bags™ best-selling seatbelt tote bag. It’s perfect to use as a shopping tote, weekend trip or for what ever you may need it for. You must be 18+ and have a US Shipping address. Please leave a comment on your favorite seatbelt tote bag. Extra entries for following Maggie Bags™ on Facebook, Twitter, Pinterest and Google +. Extra entries for each way you follow Kaisy Daisy’s Corner. Giveaway ends Jun 11, 2013. This sounds and looks really nice, perfect for Summer! My favorite color would be the cranberry. Can’t find the giveaway form but thanks for the review! when you click on here to enter it say’s: Sorry, the file you have requested does not exist. I got the same message. Sorry the file you requested does not exist. I like the Cicily Tote in Cranberry. I love a brightly colored bag, since I tend to wear neutrals. I’m crushing on the campus bag–I’d pick ultra violet, (just wish they had an ultra maroon). I love the cranberry bag! I can’t believe these bags are made from recycled seatbelt webbing. Great idea! I would love top have the Patriot Combo. I looked at all the bags. The Cicily Tote is my favorite…and the Cranberry color really pops! I would LOVE this bag in chocolate. So cute and a bit funky! The Cicily Tote looks just great to me. I’d love to have it. I love the “Tote of Many Colors” classic open top in the “Kaleidoscope Combo” design. So bright and colorful! A lovely bag and what wonderful colors! I think I would love the tote of many colors so I can use it with many outfits. I love all the colors in this bag. I wear tons of greens and browns and this would go perfectly. I like the patriot style for July. I love the campus tote in cranberry! I love the Cicily in Cranberry. i absolutely love the colors of this bag! my favorite colors have been the cranberry and the chocolate, but the camouflage is very versatile! love it! like the cranberry tote, my fav. My favorite is the messenger bag! My favorite is the Butterfly Bag or Tote of Many Colors. I love the tote of many colors in pastel. What a cool product line! I love their messenger bag! I like Maggie Bags on Facebook. I follow Maggie Bags on twitter. My favorite is the Campus Tote in Confetti Combo! Thanks for the giveaway! I love the Cicily in Lime. The Chameleon Combo tote is my favorite one. The colors would go with almost any outfit. the bailey bag would be a nice gift also. My favorite is the Tote of Many Colors. They are all lovely bags!! Love these totes! I think my favorite is the pastel combo! I love the tropical color! I love their Cicely tote and the Bailey! I love the bright multi colors! I love the multi colors? My favorite is the Tote of Many Colors in “Jazz Combo” colors. I love Love Maggie bags! The tote of many colors is my favorite! The cranberry is perfect for summer. I love the Cicily Tote in Cranberry. Would love to win—I love them all!! I love the tote of many colors!!! The Bailey bag is really cute! My favorite seatbelt tote bag is the Cicily Tote in Bullet. LOve the bright colors ..hard to pick a favorite. I guess the campus tote! difficult decision..will go for the cranberry. Really tough choice here! I love so many of them. The red, white and blue is very summery as is the brightly multi colored with the pink, navy, orange and green bottom. I think the grey and the beige are very classy and would probably go with either of those. Although the brown with the kacki stripe I could see me using allot too! Bottom line, i love them! My fave from Maggie Bags is the Bailey Bag, Maritime Combo. What an ingenious idea! I love repurposing myself, but I never thought of this. I’d take any of them, but I particularly like the Hobo Bag.